This year I have started building with stud less design, having not built anything out of Lego for some 15 years. 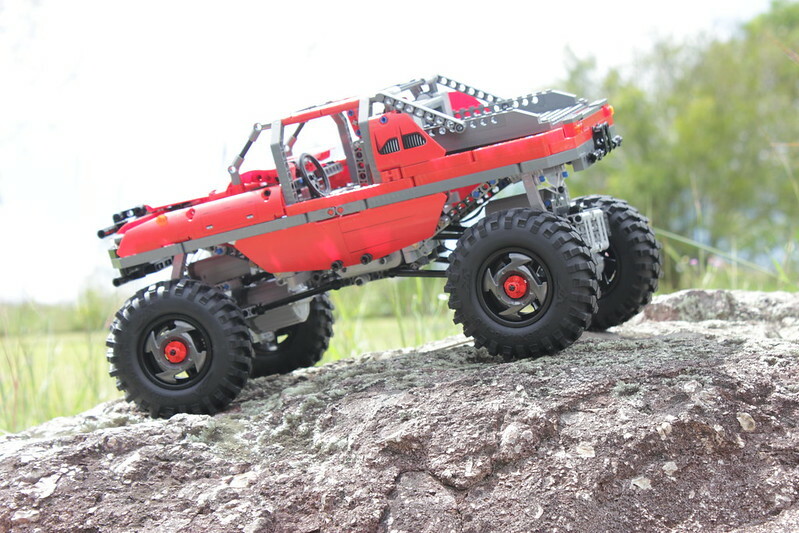 I have just finished my first 4x4 Rock Crawler and thought I would share it with everyone. The first model that actually works well! haha. 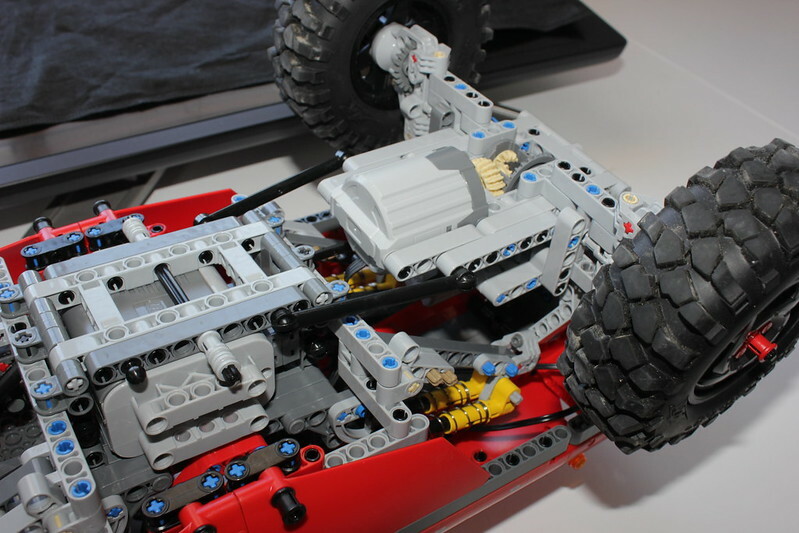 It features a unique suspension system that allows the live axles to really flex (this probably has been done tho). The downside is the tow-balls pop out. Please check it out on YouTube. Any advice, comments are much appreciated. 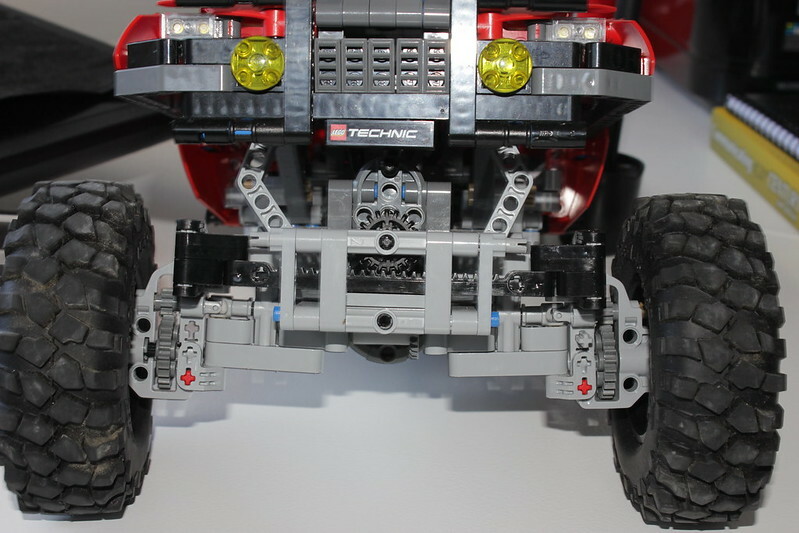 One thing I would like though, every Technic builders favourite picture, one of the underside also some information on gearing? Really awesome looking and perofrming machine. My only complaint is the fact, the XL motors are too low? Wow the body looks great, especially with those tires. I would love to see more pictures. Thank you all for the kind comments! Yes it does have differentials with limited slip. I will take some detailed pics tomorrow. awesome, one of the best climbs I've seen-similar to ones by Marcelo Raus. Wow! I really like color and the looks of it, it also climbs REALLY well! I think the only thing you should change (IMO) is to make the suspension softer because it really shakes around a bit because the suspension is not soft enough. otherwise it is really good! It shakes because it is too soft-it sways. If he made it softer it would sway too much to one side and fall over, like at the end of the video. oh.. because i once made this one suspension with 8 7L beams and put a rubber band in the middle, i never really go to try it but i had a HUGE travel distance. Thanks for the nice comments! I think its a little too soft, because it tends to roll a bit now, if fact I use lego rubber bands to keep it upright! It looks really sharp, and is very agile! 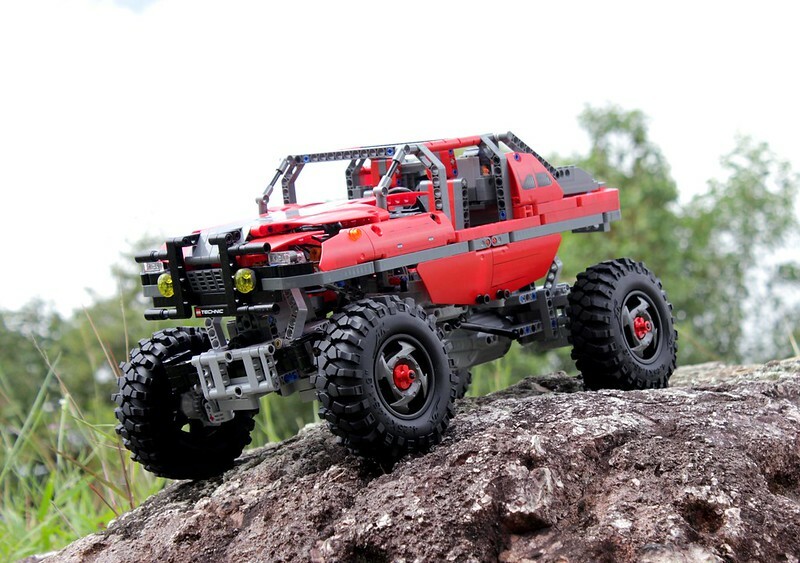 WOW, Thank you very much, he in fact inspired me a lot to build the rock crawler! I never even saw that! 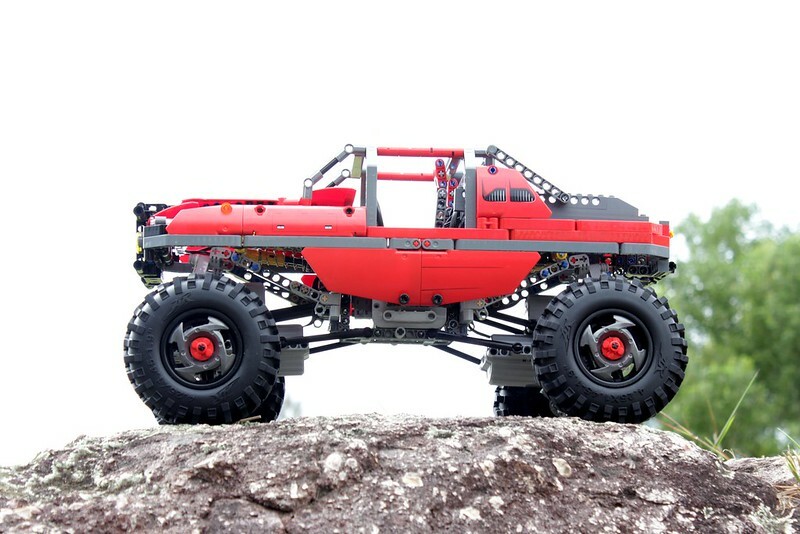 That is a awesome crawler, Like David said. 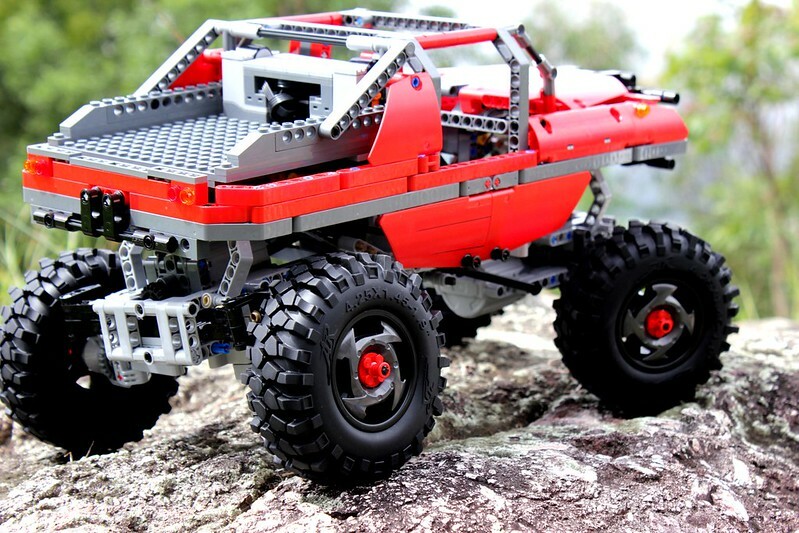 I like the 98341 pieces used for the wheels, the whole body is well done. Excellent! just watched the video. The body we very well done with some good details. Welcome to the forum. Excellent intial entry. The suspension looks quite flexible. This must help out a lot with the open differentails. Really like the wheel caps and body. 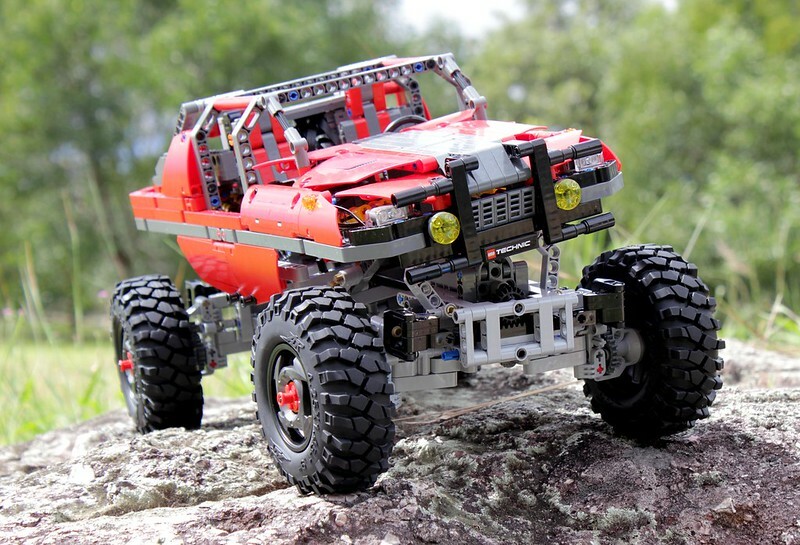 Thank you, I followed your link to extreme 4x4! love it! As requested here are some detail pics I know you guys want. Also how do you post YouTube videos with a pic? I tried following the code as specified in "posting guildlines"
LOL, its certainly looking a bit tired after its adventures! You are going to want to go to the new 8t gears in your hubs they do make a lot of difference. The track width on that beast is considerable. This factor is most likely contributing to the strained pieces we are seeing in the second picture. The geometry of this suspension is "interesting". Again, those wheel caps are awesome. To embed Youtube videos I just paste the link for the video into the post. I look at the preview post option before committing. Extreme 4x4's episode this weekend was about a 1900 footpound mud buggy on 54 inch tires. It will be EPIC!! Thanks I really loved how the wheels turned out too! I don't know anything about these new 12T, is there a thread? I was going to reinforce the axle more, but realized that more valuable 1x11 beams would get scratched the heck out of. But it does look a bit sorry now! haha But it held together ok.
Can't wait to watch Extreme 4x4's! They just came out this year. Bricklink or Lego Customer Direct will have them. http://www.eurobrick...th#entry1481990 Discussion on how they help in the reduction hubs. Sweet, thanks for that! Much appreciated.